One of America’s cultural icons seems to be going to be going through a mid-life crisis. Rising to fame in the mid-80s, they’ve gone through several transformations that have shocked the public. In more recent years, they’ve been trying to spice things up and have been recently spotted using a fake British accent. No, I’m not talking about the Material Girl, it’s your good ol’ friend Chester Cheetah. 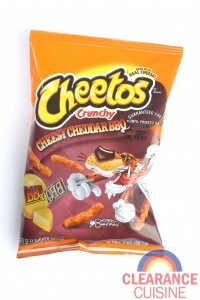 The skinny mischievous cartoon character of your childhood has now been re-imagined as a suave, CGI cat not just pushing Cheetos, but prompting an “Orange Revolution”, coaxing Cheeto consumers everywhere to ruin clothing with their fluorescent orange cheese dusted fingers. Through all of his incarnations, his acclaimed product has also transformed a bit as well. Cheetos seem to have been every shape and texture under the sun from crunchy, puffy, swirly, waffle-shaped, spicy and even color-changing. In this most likely discontinued/phased out incarnation of the product, Cheetos kicks it up a notch and combines the sweet tangy flavor of BBQ with the classic cheezy crunch. Personally, my favorite BBQ snack are Fritos Flavor Twists in Honey BBQ (the twist makes the difference), but these aren’t too bad. I think they could use a little more BBQ flavor to create the tangy yin to the cheezy yang, but they’re a decent choice considering I picked them up for a cool 25 cents. This entry was posted on Wednesday, March 30th, 2011 at 9:00 am	and is filed under Food. You can follow any comments to this entry through the RSS 2.0 feed. Both comments and pings are currently closed.